Do America’s plain Anabaptists take vacations? At first glance, it seems unlikely that an austere Christian sect would endorse spending large amounts of money on short excursions of pure leisure. Indeed, in a 1930s household expenditures survey that included Amish homes in Lancaster County, PA, Amish were more defined by their non-expenditures on leisure than today’s familiar indicators, such as technological restrictions (Reschly). And yet, vacationing is now routine among many plain Anabaptists. In this study, we explain the phenomenon of Amish-Mennonite international vacationing. The Amish-Mennonites are a branch within the greater Amish religious tradition. They represent the Amish who have chosen to blend evangelical Protestant theology into separatist communalism. They have also reduced the number and severity of norms regarding symbols and social mechanisms of separation, including convenience-oriented technologies and distinctive dress (Anderson, “Beachy Amish-Mennonite”). 1Much has been written about the Amish and vacationing, but all of it has analyzed tourism of the Amish, not tourism by the Amish (Harasta; Trollinger; Walbert). Well-known sociologist Roy Buck has been the most prolific writer on tourism in Amish country, based largely on Dean MacCannell’s classic statement of modernity argued from data addressing the Western tourist experience. MacCannell argues that, ultimately, modern people—by seeking reality in other periods and cultures—only reaffirm the alienation from their own. The Plain People are not exempt from these forces of modernity, and Amish-Mennonites, among other plain Anabaptists, have coped with modernity with mixed success (Enninger; Olshan). As we will show in the following, increased vacationing of the plain Anabaptists can be attributed to their gradual modernizing, even as they continue to hold on to a distinctive subculture. The outcome is a form of vacationing that, though triggered by modernity, is still characteristic of the Amish-Mennonite religious world. 2Amish-Mennonite vacationing must be understood within the broader context of leisure travel in the American mainstream. As America modernized, the nature of work changed. Work had long been central to people’s creative process: many individuals labored with a product from start to finish as a contribution and service to a close community. This community provided a meaningful culture and existence for individuals. Yet, as populations grew, an increasingly omnipresent industrial society divided labor into specialized niches. The result was a decline in the creative process of work, the worker’s connection to the final product, and work’s contribution to a local, known community. Specialized labor was yet another aspect which further alienated individuals from their work environment; yet at the same time the societal importance placed on work increased, making it inescapable. For many, work became tedious, a cultureless environment nevertheless central to their existence (MacCannell 35–36). 3In no occupational shift is modernism’s effect more apparent than in the move from agriculture to day-labor. Household-based, diversified agriculture demands large families for labor, an ongoing presence to tend to livestock, a locally dense and supportive network, and an economy of bartering—all forces that prevent family farmers from traveling often, for long durations, and far from familiar networks. The day laborer has a narrower set of skills, works fixed hours, and operates in a relatively impersonal environment. Work is away from home—the geographical location core to one’s being—rather than at home. 4While much of America transitioned away from agriculture across the early 20th century, the Amish-Mennonites only made the transition in the past three decades, and it is still occurring (Smith). In occupations of day labor, schedules are grueling, typically exceeding 40-hour workweeks, in addition to the often long commutes from rural homes to population centers. Not only are household heads exacerbated—stay-at-home Amish-Mennonite moms face tedium as well. When the typical Amish-Mennonite family was on the farm, the wife labored beside her husband, producing tangible products. She could also easily put children to work. The move away from farming confines women to their residences, separates them from a tangible product of their labor, and provides fewer opportunities to keep children occupied with chores (Anderson, “Evangelical Reorientation”). 5The Amish-Mennonites were not alone in these changes. Numerous plain Anabaptists felt the squeeze out of farming and into day-labor positions, including the Old Order Amish (Foster; Kreps, Donnermeyer and Kreps; Winpenny) and conservative Mennonites (Tomomi), especially those in larger settlements near urban centers. Longer in waiting was the transition for horse-and-buggy Old Order Mennonites, but now they too have been gradually moving away from full-time farming (Reid). While some researchers argue that Plain People were pushed out of farming due to a land squeeze, a more likely possibility is that the standard of living among Plain People has gone up and subsistence farming cannot sustain it. 6In the American mainstream and among plain Anabaptists, demand for leisure experiences grew in response to changes in work. Leisure became a time to rejuvenate and then return to work refreshed. Fun and meaning was to be found in these experiences rather than through work alone. Hence, tourism became an important outlet. And as leisure demand grew, new developments in America (e.g. airplanes, automobiles, trains, and superhighways) helped facilitate it. 7While some Amish-Mennonites have joined their mainstream American counterparts in leisure travel, they have subjected vacationing to the constraints of a value system bearing resemblance to Max Weber’s Protestant work ethic. Ton van Egmond, in extending Weber’s theory to international tourists, provides a framework from which to understand the intersection of Amish-Mennonite values and their vacations. He argues that tourists from the Protestant countries of Northern and Western Europe, though largely secularized, nonetheless still exhibit behaviors consistent with the Protestant ethic while vacationing in developing countries. These behaviors include, one, not wasting time (making itineraries full, educational, and productive); two, valuing asceticism (shying from luxurious tourist accommodations); and, three, accepting that the individual has a responsibility to the world through volunteering, or, at the very least, feeling guilt when seeing poverty (van Egmond 122–23). 9What is this work? It is primarily humanitarian aid and religious outreach. Being evangelicals, the Amish-Mennonites have established an international presence in accordance to Jesus’s Great Commission, “Go ye therefore, and teach all nations” (Anderson, “Religiously Motivated Migration” 391). Some presences consist of Amish-Mennonites who permanently relocated outside North America, establishing new communities and churches. In these communities, members buy land, establish businesses, and go about their day-to-day affairs much as American Amish-Mennonites do, except outreach and evangelization programs are much stronger and, accordingly, local converts number many more. Such churches are located in Paraguay, Costa Rica, Nicaragua, El Salvador, Belize, and Romania. 10The other type of presence outside North America is American-run mission organizations with rotating staff. North American Amish-Mennonites operate several major religious mission organizations engaged in church planting—the most active being Amish-Mennonite Aid (AMA)—and one humanitarian aid organization called Christian Aid Ministries (CAM) that enjoys the auspices of many other conservative and Old Order Anabaptist denominations. Churches are located in some of the aforementioned countries as well as Honduras, Mexico, Ireland, Ukraine, Kenya, and Liberia; CAM presence can be found in yet other countries (Anderson, “Beachy Amish-Mennonite”). Staff terms are typically two or more years. Some staff are appointed as ministers, and their daily duties pertain to local service and outreach while other staff tend to the logistics of humanitarian efforts. In both cases, housing, food, and a monthly stipend are provided. 11While this work is primarily left up to missionaries and international personnel, Amish-Mennonite vacationers frequently visit international churches and mission stations to provide short-term assistance. These visits are also recognized under terms, such as “volunteer tourism” and “short-term mission trips.” Often, these vacationers come in groups. For example, one New Order Amish youth group visited Kenya: “That group cemented the back porch for us,” detailed their host. “The girls made some pear sauce and they cleaned for us, ah, they were amazing! And then they went and passed out [religious] literature. [T]hey came with a mentality that they wanted to be helpful […] and they really were.” Visiting such places sanctifies a trip, as setting aside time for spiritual and material outreach is religiously edifying. This is especially important in reassuring mature vacationers that they are engaging in worthwhile travel, not just frivolous pursuits. Summarized succinctly, one former missionary wrote, “Many [visitors] were supporters of the mission and desired to observe the work God was doing” (Glick 210). 12While not all Amish-Mennonite vacationers participate in volunteer tourism, the many who do volunteer epitomize the Protestant work ethic. Short-term workers maximize time, vacation on a budget, and contribute to global needs. Programs, such as Sharon Mennonite Bible Institute’s WATER—a six-week summer mission program—frame the trips as the “trainees” engage in duties around the mission while participating in visitation and evangelism efforts. Their duties could include cooking and gardening for females and repairing automobiles and fixing buildings for males. 13Amish-Mennonite volunteer tourism echoes a larger short-term mission trip movement among American Christians (Offutt). Short-term mission programs serve as a subtle critique against the consumerism and self-centeredness of mass tourism. For one, mass tourism is a reward for or an escape from work whereas volunteer tourism relocates work to a needy setting. Also, mass tourism is consumer-focused whereas volunteer tourism stresses giving to local communities. To give, tourists must perceive needs, so part of the experience is feeling compassion when viewing poverty and being able to respond. Through this experience, tourists receive a sense of self-contentment (which reinforces separatism) and learn to respond critically to Western materialism and individualism (van Egmond 105–10). Both giving to others and using work as a means to help others are deeply-rooted ethics among plain Anabaptists, making volunteer tourism much more palatable to Amish-Mennonites than other forms of tourism. 14What the Protestant ethic model lacks is the plain Anabaptist’s stress on the religious community as an indispensable vehicle. Unlike the Calvinist-based ethic, which mandates asceticism and hard work to evidence salvation and tends toward individualistic competition, the plain Anabaptists view the preservation of a separatist community as necessary for an individual to realize Christian devotion and redemption. Calvinism encourages capitalist competition while plain Anabaptists see nothing gained from competition (Appling). For that reason, plain Anabaptists have long stigmatized time away from the community, time immersed in non-plain settings, and prolonged social autonomy. Certainly, their condemnation of being away from the community is compounded when paired with frivolous pleasure-seeking which is considered suspect and deviant. 15An international vacation to missions and churches, however, sanctifies leisure. Beyond making judicious use of one’s time and resources, vacationing at a mission station emphasizes the centrality of religious community. Leisure activity is conducted within the trusted patterns of a constituent program. For example, if left alone while abroad, young adults—who are the most prone to waver in their conviction—could take the opportunity to engage in deviance. “They would probably not be allowed to come if they say they are visiting the […] coast, no way,” said one missionary, who has coordinated many youth visits. “But to visit someone on the mission field, that is acceptable.” Visitors to missions can be included in the programs, schedules, and activities, which—if designed by the mission board for missionaries—should certainly be acceptable for North American guests. 16While mission trips are framed as work, their doubling as leisure is apparent. Tellingly, Amish-Mennonites take their trips preferably in North America’s winter months, the time when construction work is slow and the tropics are especially attractive. Studies of other American-based short-term mission trips have found that these vacations provide self-renewal that reinforce one’s sense of religiosity (Beyerlein, Trinitapoli and Adler; Trinitapoli and Vaisey) and a reduction of work-related burnout stress (Campbell et al.). The appeal—the fun and leisure—of tourism, as MacCannell stated in the 1970s, lies partly in experiencing the world in all its differentiated forms, such as various establishments, groups, occupations, public works, and transportation networks (48–56). While mass tourism might be different today, MacCannell’s findings are true for Amish-Mennonite vacationers. Ironically, the very differentiation and specialization that has made work more alienating—and vacation all the more needed—is part of the vacation experience. 17Of course, Amish-Mennonites when on the other side of the world want to see those family-friendly sites many Western tourists visit, sites that bespeak of the modern differentiated world. Amish-Mennonite Aid is aware of regional attractions near missions and provides staff guidance for taking their visitors. In Paraguay, AMA covers the cost of tickets for staff to take visitors to the Iguaçu Waterfall and Itaipú Dam. One Paraguayan missionary estimated he had driven the ten-hour round trip to the falls around twelve times in his first year. In Kenya, the two-to- three day Masai Mara game reserve trip is a routine place for missionaries to take guests. The Dunmore East Christian Brotherhood church in Ireland is especially ideal for the tourists who want more autonomy in their touring; they can rent a vehicle and travel the country, visiting castles, cliffs, and the countryside. 18Amish-Mennonite tourism, however, goes beyond seeing standard, sanctified tourist sites by including the opportunity to experience part of the faith that has been specialized: evangelical outreach. MacCannell, in naming categories of tourist experiences, makes no mention of how tourists experience religion and spirituality, aside from religion as a site or group. 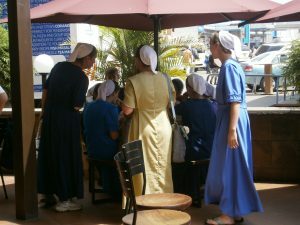 While Amish-Mennonites continue to experience separatism in everyday practice as do the Old Order Amish, the evangelical, outreach missionary segment of their religion, in which the Old Order Amish do not participate, is largely relegated to certain times and places (the “mission field”) and engaged in by specialists (“missionaries”). To some degree, this is necessary for Amish-Mennonite separatism to work in America. Thus, some of the fun for Amish-Mennonite tourists is being able to visit a social structure where evangelical activity is part of everyday life, something they are largely deprived of in America where outreach is taught, but rarely acted upon in deeply meaningful ways. 19Amish-Mennonite tourists may experience the evangelical faith in at least two ways. First, they have the opportunity to interact with another culture that has spiritual and material needs they can respond to through their missions. Second, in America, many Amish-Mennonites read missionary storybooks written by or about other Amish-Mennonites. Visiting the sites of these narratives allows tourists to more personally experience these missionary stories, thus making even more real the excitement of the outreach in these books. Come enjoy the African culture and its people as well as see the many physical and spiritual challenges present in this country. Students coming here could experience interacting with those in abject poverty by going into the interior with a native pastor for evangelistic meetings, hiking to nearby villages, intermingling with the townspeople and children, sewing, teaching summer Bible school, visiting orphanages, and distributing baby bundles. 22Though cross-cultural interaction is an attraction, tourists need some encouragement to socialize with locals, given the inclination of Amish-Mennonites to stay close to their networks. In an anonymous advice brochure for visitors, the author writes the following encouragement: “Visit the folks around us. Recruit one of my children as a personal translator. He’ll walk you around the neighborhood. Make friends. Try to buy something at the roadside stores all on your own. Gestures really do help. You’ll all laugh—and they’ll love you” (Anonymous). 23For some, the tourist experience also entails seeing places and people from missionary writings, much like tourists go to Prince Edward Island to experience Anne of Green Gables, but with religious overtones. While stories have been written about missions in El Salvador, Belize, Paraguay, Kenya, and Romania, Amish-Mennonite tourism activity is most active in the central Nicaraguan frontier town Waslala, thanks to the news updates and books of Pablo Yoder. He is emblematic of Latin American Amish-Mennonite mission work and is widely known by his Spanish name, Pablo rather than Paul. In the early 1990s, Yoder and another Amish-Mennonite family moved to Nicaragua from Costa Rica. Their rural location was along the former civil war border region, which remained at times a pocket of partial anarchy. Viewed as wealthy North Americans, Yoder and others became the target of repeated armed home robberies, robberies that were tense, head-to-head confrontations. 24As nonresistant people, the Amish-Mennonites refuse to fight. Thus, Yoder and his group peppered these encounters with religious counter-responses, trying to confuse the robbers with Jesus’ turn-the-other-cheek approach. For support, Yoder began sending out letters about their encounters to North American friends. Word spread and subscriptions grew. A North American manager eventually volunteered to copy and mail letters. Today, the letter is distributed by email to around 3,500 subscribers. From these letters, Yoder has published books, the first being Angels over Waslala. The appeal of Yoder’s writings is his sensationalist depictions of good against evil and the use of religion as a weapon against evil. His writing is suspenseful, bringing unfamiliar energy to modern plain Anabaptist life and doctrine (Anderson and Anderson). Additionally, Yoder’s publishers are experts at taking out the reality from the books to provide Plain People in America with a sanitized version sensitive to the limited experiences separatists have had with uncensored mainstream cultures. They want a nature trip, see where the robberies actually happened, see the windows where we crawled out. We could make a museum! [Co-author] Phil Cohen said you could take little vials of dirt from Waslala and sell it in the States. Or, you could sell “Boca Abajo!” [face down!] T-shirts. […] The robbers came five times and said this; it became a slogan. […] I have a collection of robber paraphernalia, the gun they left behind, ropes they tied me up with. Andy Yoder thought about bringing a group down, they would pay for their costs, have a meal at Pablo Yoder’s, show them robber paraphernalia, have someone show them around, send them to a new nice hotel in Waslala for the night—only around $10. 26The sheer number of visitors cuts into the missionaries’ family and church time, an oft-repeated criticism of Yoder’s writings from fellow missionaries. Though Waslala missionaries have not turned down visit requests, they have raised the costs. For one, visitors must take public transport from the capital Managua to Waslala, a six-hour ride on a bumpy road in a brightly repainted throw-back era American school bus. Still, the draw to Waslala-land is strong. Some of them in the stories were not robbers at all, some of those that come with machetes or arms are men who are living in the jungles, in the mountains, and […] they don’t have food, don’t have medicine, represent a group of men back there they are relating to, might have been contras, and they need food and medicine, and they come up to the door and ask for food or medicine, they carry guns or machetes because they just have them like their boots, and they come and ask for something. 29These responses to Yoder’s writings by other Central American missionaries—both the unpublicized hardships they face and Yoder’s propensity to exaggerate—suggest that Amish-Mennonite tourists are responding not to the reality of day-to-day missions but rather to those packaged to North Americans as hallmarks of their evangelical faith. Whatever the truth, the books are undeniably appealing to American Amish-Mennonites, drawing visitors who want to see the actual place otherwise confined to their imagination. Being able to see these places and people helps tourists experience the fervor that accompanies the book, an experience largely unavailable in the increasingly differentiated lives of North American Amish-Mennonites. 30While international churches serve as a vacation spot for North American Amish-Mennonites, these churches are not visited evenly. Three factors determine visitor numbers: one, US sponsorship of an international church; two, church newness; and three, church publicity in the US. All three factors suggest that Amish-Mennonite visits are vacation-oriented as popular secular vacation sites around the world foster these three relationships as well: ties with America, newness, and publicity. 31First, churches under the direct sponsorship of North American-based organizations tend to have stronger ties to North America. Mission staff turnover promises a fresh stream of friends and family visiting every two to four years per position. One clinic administration couple related that they had not anticipated how much time they would end up spending accommodating guests. As short-term mission trips grew in popularity among Amish-Mennonite (and conservative Mennonite) youth, North American Bible schools, such as Sharon Mennonite Bible Institute (SMBI) in Pennsylvania, started offering matching services. Participants of SMBI’s WATER program choose a short-term trip from among several international destinations, destinations all under the sponsorship of a North American mission agency with the only exception being the Waslala churches. 32Second, newness attracts visitors, be it a new mission or new personnel. Newness means connections with North America are still fresh and numerous, and many tourists want to see the new site. With time, visitors decline; the Costa Rican churches, which have been in existence for nearly 50 years, see few North American tourists. One bishop said, “when [missionaries] come over for two years, [they] get lots of visitors when they need them the least […] but the longer you are here, the less you get visitors.” Consequently, to keep destinations fresh, mission organizations have regular staff turn-over and occasionally consider new places to start churches, aid centers, and outreach programs. Old missions—as with those in Belize and El Salvador—are gradually weaned from mission connections. 33Third, missions publicized in public presentations and literature––such as missionary adventure stories and newsletters––attract visitors. Christian Aid Ministries’ early newsletters and open house presentations about the Nathanael Christian Orphanage in Romania inspired many North Americans to visit this Amish-Mennonite run children’s home. 34The Amish-Mennonites have grappled with the forces of modernity, especially in the pursuit of vacationing as a response to the work transition from agriculture to day-labor. In that respect, they don’t differ from modern American tourists. However, given their values—bearing resemblance to Weber’s Protestant work ethic—and emphasis on community, they subject vacationing to an experience consistent with their religious reality. This is evident in the tendency of vacationers to visit international Amish-Mennonite mission efforts to see and contribute to the work. 35Engaging with mission work allows Amish-Mennonites to momentarily consolidate one fragmented piece of themselves—the outreach emphasis of their evangelical theology—with the rest of their life. In America, Amish-Mennonites are afforded few opportunities to engage in meaningful evangelical outreach, partly because modernity has allowed little room for it in their day-to-day lives, partly because overly engaging with outreach will pose a threat to the separatist ethno-religious system they still seek to maintain. 36Despite a decently-sized body of literature about Plain People in tourism, this is the first piece to focus on the tourism conducted by plain Anabaptists. Certainly, vacationing among plain Anabaptists is neither limited just to Amish-Mennonites nor to international destinations. Old Order Amish, Old Order Mennonites, conservative Mennonites, and others, are increasingly engaging in tourist activities. For example, “western trips” to the natural sights of the Rocky Mountains and the west coast or to the high amenity rich areas like the Appalachian Mountains—where many plain Anabaptists have hunting land and cabins—are popular. Plain Anabaptists also regularly take winter vacations to Sarasota, Florida, and summer vacations to the beaches of New Jersey and Delaware. Research on these vacation types may produce findings divergent from the model presented here as there seems to be no religious sanctioning mechanism on what otherwise appears to be forms of consumer-oriented mass tourism. 37Acknowledgements: The study was supported through the Mennonite Historical Society’s open research grant and the Society for the Scientific Study of Religion’s graduate research grant and Jack Shand research grant. Those assisting us with our travels are too many to name, but we would especially like to acknowledge the extra efforts of Arthur Nisly, Sanford Nissley, Timothy Schrock, Gerald Yoder, Phil Yoder, and the Kisumu summer 2015 staff. If not indicated otherwise, quoted statements refer to personal interviews conducted by the authors. Further information has been withheld to protect the identity of the interviewees. The most conservative Amish groups, such as the Swartzentrubers, continue farming as a primary occupation, even in the relatively large Greater Holmes County settlement in Ohio. One Swartzentruber Amishman in another state related that the average family in the settlement makes around $8,000 annually. Given that so much of what is needed is made at home—food, clothing, animal feed, and building materials like lumber—the actual net worth of the families is much higher and cannot be represented in cash alone. Cash is needed for complexly produced goods, such as plastic-based items, associated with a higher standard of living. Surprisingly, little has been noted of the parallel between Weber’s Protestant work ethic and the Amish. An exception is Martin Lutz’s work (see this issue). Even when plain Anabaptists deviate in vacationing, they do it within a community context. Many of these vacationers heading to the beaches of Florida will go to one coastal city and lay out on but only one of two beaches. Although pursuing hedonistic pleasure and dressing immodestly, they are still within a community context. From a WATER program brochure, no date but probably around 2013. Anderson, Cory. “Beachy Amish-Mennonite.” Global Anabaptist Mennonite Encyclopedia Online. May 2014 Web. 8 Aug. 2016. —. “An Evangelical Reorientation: The Contribution of Beachy Amish-Mennonite Mothers.” Mothering Mennonite. Ed. Rachel Epp Buller and Kerry Fast. Bradford, ON: Demeter, 2013. 236–55. Print. —. “Religiously Motivated Migration.” Sociological Quarterly 57 (2016): 387–414. Print. Anderson, Jennifer, and Cory Anderson. “Conservative Mennonite Storybooks and the Construction of Evangelical Separatism.” Journal of Amish and Plain Anabaptist Studies 2.2 (2014): 245–77. Print. Anonymous. “15 Things a Central American Missionary Won’t Tell You.” n.p. 2013. Print. Appling, Gregory. “Amish Protestantism and the Spirit of Capitalism.” Cornell Journal of Social Relations 10.2 (1975): 239–50. Print. Beyerlein, Kraig, Jenny Trinitapoli, and Gary Adler. “The Effect of Religious Short-Term Mission Trips on Youth Civic Engagement.” Journal for the Scientific Study of Religion 50.4 (2011): 780–95. Print. Buck, Roy C. “Boundary Maintenance Revisited: Tourist Experience in an Old Order Amish Community.” Rural Sociology 43.2 (1978): 221–34. Print. Campbell, Clark, et al. “Reduction in Burnout May Be a Benefit for Short-Term Medical Mission Volunteers.” Mental Health, Religion & Culture 12.7 (2009): 627–37. Print. Enninger, Werner. “Coping with Modernity: Instrumentally and Symbolically, with a Glimpse at the Old Order Amish.” Brethren Life and Thought 33 (Summer 1988): 154–70. Print. Foster, Thomas W. “Occupational Differentiation and Change in an Ohio Amish Settlement.” Ohio Journal of Science 84.3 (1984): 74–81. Print. Glick, Mary June. No More Strangers. Harrisonburg, VA: Christian Light, 2014. Print. Harasta, Joseph M. “The Amish—A People of Preservation and Profitability: A Look at the Amish Industry in Lancaster County, Pennsylvania.” Journal of Amish and Plain Anabaptist Studies 2.1 (2014): 23–41. Print. MacCannell, Dean. The Tourist: A New Theory of the Leisure Class. New York: Schocken, 1976. Print. Offutt, Stephen. “The Role of Short-Term Mission Teams in the New Centers of Global Christianity.” Journal for the Scientific Study of Religion 50.4 (2011): 796–811. Print. Olshan, Marc. “Modernity, the Folk Society, and the Old Order Amish: An Alternative Interpretation.” Rural Sociology 46.2 (1981): 297–309. Print. Reid, Judson. “Old Order Mennonites in New York: Cultural and Agricultural Growth.” Journal of Amish and Plain Anabaptist Studies 3.2 (2015): 212–21. Print. Reschly, Steven D. “Makers and Markers of Distinction: Technology and Amish Differentiation in the 1935–1936 Study of Consumer Expenditures.” Journal of Amish and Plain Anabaptist Studies 2.1 (2014): 125–47. Print. Sharon Mennonite Bible Institute. “WATER.” 2016. Web. 8 Aug. 2016. Smith, William. “Continuity and Change in a Southern Beachy Amish-Mennonite Congregation.” Journal of Amish and Plain Anabaptist Studies 1.2 (2013): 48–68. Print. Tomomi, Naka. “Faith at Work: Mennonite Beliefs and Occupations.” Ethnology 47.4 (2008): 271–89. Print. Trinitapoli, Jenny, and Stephen Vaisey. “The Transformative Role of Religious Experience: The Case of Short-Term Missions.” Social Forces 88.1 (2009): 121–46. Print. Trollinger, Susan. Selling the Amish: The Tourism of Nostalgia. Baltimore: John Hopkins UP, 2012. Print. van Egmond, Ton. Understanding Western Tourists in Developing Countries. Oxfordshire, UK: CABI, 2007. Print. Yoder, Pablo, and Philip Cohen. Angels over Waslala. Deer Lodge, TN: Harbor Light, 1998. Print. Walbert, David J. Garden Spot: Lancaster County, the Old Order Amish, and the Selling of Rural America. Oxford: Oxford UP, 2002. Winpenny, Thomas R. “Recommitting vs. Selling Out: The Subtle Industrial Revolution Among the Amish of Lancaster County, Pennsylvania.” Values and Technology 37 (2011): 135–43. Print. Cory & Jennifer Anderson, as husband and wife, are collaborating on research about plain Anabaptist churches outside North America. Cory received his Ph.D. in Rural Sociology from Ohio State University and is currently a visiting assistant professor of sociology and geography at Truman State University, Kirksville, MO. He is co-founder and editor of the Journal of Amish and Plain Anabaptist Studies. Jennifer received a B.S. from Keuka College, New York State, in Unified Elementary and Special Education and has written about special education in plain Anabaptist settings. Anderson, Cory, and Jennifer Anderson. “Sanctifying Leisure: Volunteer Tourism among America’s Amish-Mennonites.” American Studies Journal 63 (2017). Web. 24 Apr. 2019. DOI 10.18422/63-07.